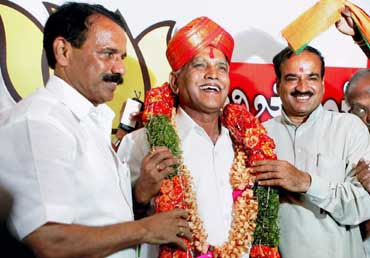 Bookanakere Siddalingappa Yeddyurappa, who seems set to take over as the Karnataka chief minister following his party's historic electoral win, began his political career as an active member of the Rashtriya Swayamsevak Sangh (RSS) at the age of 23 years. Yeddyurappa became the BJP's first chief minister in Karnataka and in the south in November last year at the head of a shaky coalition with the Janata Dal-Secular (JD-S). But his stint lasted just a week, from Nov 12 to Nov 19. The JD-S withdrew support. He resigned on Nov 19. A staunch believer, he often visits temples and various mutts seeking blessings. He also consults astrologers. Yeddyurappa slightly changed his name, reportedly on the advice of his astrologers. He cut out the 'i' and added a 'd' to his name. Known to be a strict disciplinarian and man of short-temper, Yeddyurappa was born to Siddalingappa and Puttathayamma in Bookanakere in Mandya district, about 100 km from Bangalore, Feb 27, 1943. He lost his mother when he was just four years old. An arts graduate, he is a widower. He has three daughters and two sons, none of who is in politics. Although born in Mandya district, Yeddyurappa made Shikaripura in Shimoga district, about 300 km from Bangalore, his political base. He entered active politics in 1972 when he was elected president of the Shikaripura Taluk Jana Sangh. Yeddyurappa shot into statewide fame soon after he took up the cause of landless farmers and bonded labourers in the state, particularly in Shimoga district. He was detained for a brief period during the internal emergency then prime minister Indira Gandhi imposed in 1975. He was appointed the state Janata Party secretary in 1977. Yeddyurappa entered the Karnataka Assembly for the first time in 1983 from Shikaripura constituency. He won from there five times and lost once, in 1999. He was appointed the all India secretary of BJP in 1992 and has been president of the state unit for two terms. Yeddyurappa is a powerful public speaker in Kannada and is largely credited with taking the BJP's strength in the 225-member Assembly (including a nominated member) to 79 in the 2004 elections. He had toyed with the idea of leaving the BJP after the 2004 polls because his party did not project him as the chief ministerial candidate. He acknowledged recently that he did plan to leave the party as he was upset with it but added that will never again commit that mistake. He has detractors within his party, mainly national general secretary and fellow state leader HN Ananth Kumar. In fact HD Kumaraswamy, who became chief minister with the support of BJP in 2006, had named Ananth Kumar as one of the BJP leader who tried to scuttle Yeddyurappa from taking over as chief minister from him (Kumaraswamy). Yeddyurappa became deputy chief minister in the Kumaraswamy ministry in 2006 and held the finance portfolio. His pro-farmer budget and decision to ban sale of lotteries and arrack earned him high accolades. For most part of his political career, Yeddyurappa has steered clear of controversies. But a section of his party is upset because of his alleged proximity to party legislator Shobha Karandlaje. It's not for the rich alone! Will Karnataka bring BJP nearer to Delhi? Dec 23, 2006, VT: Why is Yedi Still In Shimoga?